In 1961, Fleer decided to try what Topps and Bowman already tried and moved on from. They printed a set of basketball cards. Like the others, they stopped production after only one season. While the company would become very successful issuing basketball cards a quarter century later, 1961-62 Fleer Basketball didn't appear to have sold well. Card fronts were broken into two parts. The player appeared in the bottom part, in a posed shot set against a solid background. His team name and logo appeared in the top box, with his name and position appearing in a white strip between the two parts. The backs were oriented horizontally, with a blue stripe down the right side. A near-circular notch in the stripe had the card number inside. The player's name, position and team appeared at the top, followed by his vital statistics, which were underlined in blue. Most of the rest had a written biography of the player, followed by is stats from the previous year and lifetime totals. There are 66 cards in the 1961-62 Fleer Basketball set. The first 44 are regular player cards, and the last 22 were In Action cards featuring players who also appeared in the first 44 cards. The players in each section are arranged in alphabetical order by their last names. Most cards in the set are found with centering issues, which makes true high-grade specimens especially valuable. 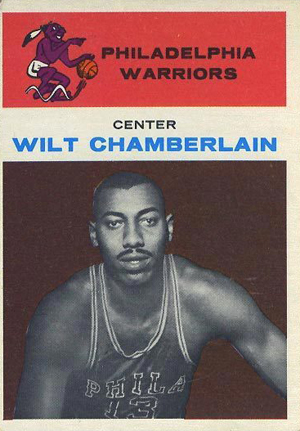 The key card in the set is Wilt Chamberlain's rookie card, but several NBA superstars' first cards are found here. These stars include Jerry West, Oscar Robertson, Elgin Baylor and Len Wilkins. All of these rookies except for Wilkins are also featured on action cards. In my opinion one of the greatest sets ever made. Awesome rookies, beautiful cards, and a great set to put together. My dad started this set and never completed it. He passed away in 06 and I hope I hit the lottery so I can complete it. Thanks. Halfway done building my 1961 Fleer PSA set!! 33 down & 33 to go!! Started building this set about a year ago.. Excited to see it start coming together!! I do have some duplicates that I would be open to trading for other cards in this set.. Also open to trades for cards from 1948 Bowman and 1957 Topps.. Decided to try to build all of “The Big Three” for vintage basketball!! And thanks for the info CardboardConnection! !